This 3 day Classic Cultural Experience Package to Deception Valley, takes you into an oasis in the Central Kalahari - home to a wide variety of wildlife and birdlife. It is famous for its Brown Hyenas. 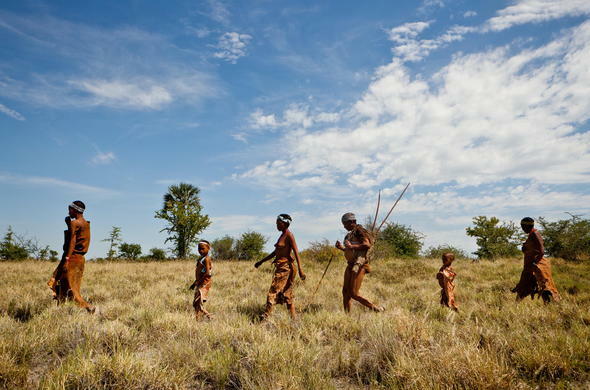 This 3 day Classic Fly-in Package to Deception Valley allows you to experience the world of the San Bushmen of the Central Kalahari. They have lived in this region for over 20 000 years, and you can learn about their ancient culture. You will have a chance to interact with them and learn how they survive in this harsh landscape on your Botswana holiday. 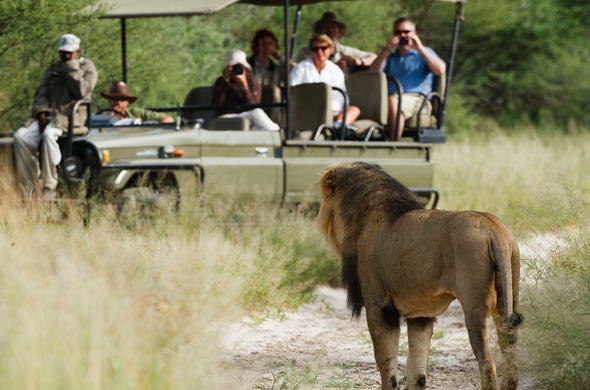 Interpretive bush walks and game drives are offered, where you will set off with the Bushmen guides. 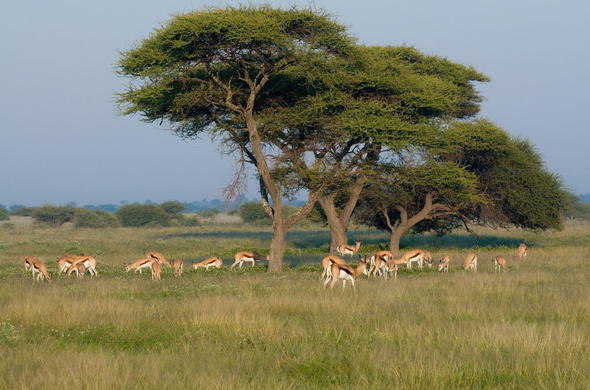 These excursions are a good opportunity to see the many animals that have adapted to living in this harsh landscape, including Gemsbok and Giraffe. This is one of the best places in Botswana to see Cheetah, and the Black-maned Kalahari Lion which can go for weeks without food and water. On the first day of your 3 day Classic Fly-In package to Deception Valley you will travel from Johannesburg to Maun, Botswana on a scheduled flight. Then you will catch a light aircraft flight into the Central Kalahari. You will be welcomed by the staff and will have time to settle into the safari lodge, before heading out on an afternoon game drive. You might see Gemsbok, Eland and Kudu, as well as other antelope which are adapted to living in the dry desert environment.You'll stop off in the wilderness and enjoy refreshing drinks, while watching the spectacular sunset, before continuing your game drive. This allows you to see some of the nocturnally active animals such as Aardvarks. You will return to camp to enjoy a delicious dinner under the brilliant African stars. You will have an early morning wake-up call followed by a light breakfast, after which you will head out on a morning game drive, or bush walk, before the day heats up. 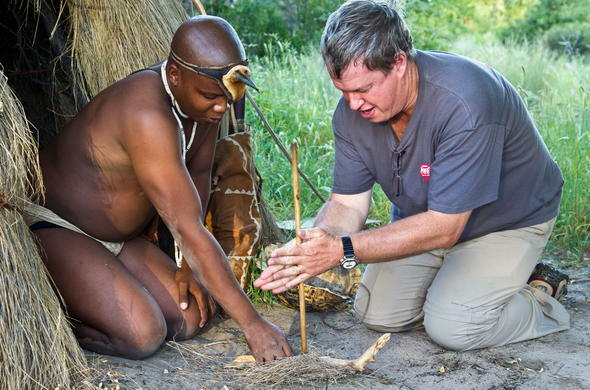 You can go exploring in the wilderness with the San Bushmen - they will show you how they live in this desert environment and how they find food. It is a marvellous journey to learn about one of the oldest cultures on Earth. Surprisingly, the area is home to abundant birdlife, and these bush walks are a great opportunity to see many different species.After your morning safari activity, you will return to the safari lodge and enjoy a tasty lunch, followed by some time to relax. In the afternoon you will have a high tea which will sustain you through the afternoon game drive. Once again you will head out to see what animals you can see - maybe you'll even catch a glimpse of the rare Brown Hyena. You'll return to camp for a delicious candlelight dinner. On the final day of your 3 day Classic Fly-in Package to Deception Valley you will have time for one last early morning game viewing activity and a delicious breakfast. You will be transferred to the airstrip before catching the light aircraft flight back to Maun, from where you connect onto your flight onward to Johannesburg O.R. Tambo International Airport. This 3 day Classic Fly-in Package to Deception Valley includes scheduled flights ex/to Johannesburg O.R. Tambo International Airport. The rate is calculated per person sharing a room. This Botswana package can also be combined with a stay in the Okavango Delta and Chobe National Park.